NASA's Mars rover Opportunity rests at the southeast rim of Santa Maria crater. 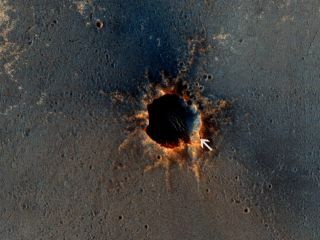 NASA's Mars Reconnaissance Orbiter snapped this photo on March 1, 2011. A new photo from a satellite orbiting Mars shows NASA's long-lived Opportunity rover perched at the rim of a crater, busily working away. The tracks Opportunity made as it approached the 295-foot (90-meter) wide crater from the west are clearly visible in the image. Opportunity has nearly finished its work examining mineral deposits at Santa Maria and will soon resume its long trek toward the huge Endeavour crater, a quest the rover has been on for nearly three years, officials said. A close-up of the Opportunity rover perched at the southeast rim of Mars' Santa Maria crater. The Endeavour crater on Mars is a vast depression about 14 miles (22 km) wide. Opportunity has been heading for it since August 2008 because it will give scientists their deepest look yet into the surface of Mars. The goal is to study any clay deposits — a sign of Martian water activity in the ancient past — that may be present on Endeavour's rim, researchers have said. Opportunity and its twin, Spirit, landed on the Red Planet in January 2004 for what was then only a three-month mission to look for signs of past water activity on Mars. Both rovers delivered in a big way, turning up a flood of evidence at their different landing sites indicating that the Red Planet was once a much wetter, warmer place. And the rovers just kept rolling along, years past their warranty dates. While Opportunity is still going strong, Spirit went silent in March 2010 after getting stuck in soft sand and failing to maneuver into a position that would slant its solar panels toward the sun over the course of the Martian winter. Researchers have held out hope that Spirit could warm up and wake up with the onset of Martian spring, which is in full swing now. The Mars Reconnaissance Orbiter has also completed its prime mission and is operating in an extended mission. The spacecraft arrived at Mars on March 10, 2006, so tomorrow marks the five-Earth-year anniversary of the spacecraft's operations at the Red Planet.